Some people think golf is a leisurely activity; golf is an all-around body workout. 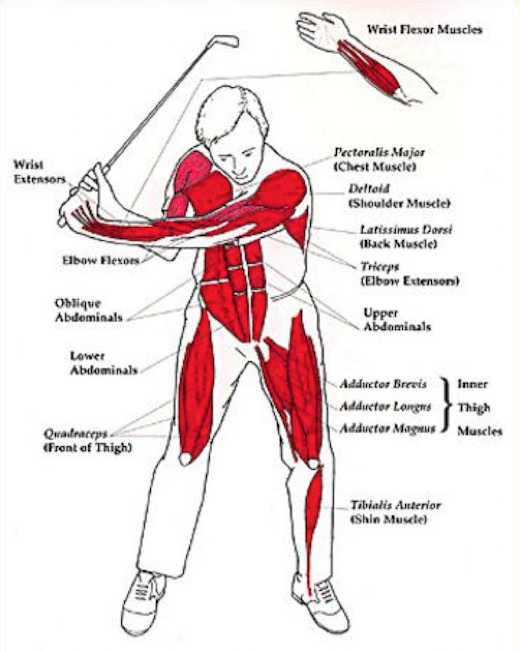 A golf swing works muscles in the upper and lower body. If Golfers know the basic muscle groups engaged when playing golf and which muscles are used to create the perfect swing their golf game will improve, they’ll avoid injury, and learn which muscles to focus on when they work out. Occasional injury and/or muscle pain is a common side effect of performing any athletic activity, including playing golf. A golf swing can cause a major effect on muscles, tendons and soft tissue ranging from temporary discomfort to a serious injury. One possible and common effect is delayed-onset muscle soreness, or DOMS. 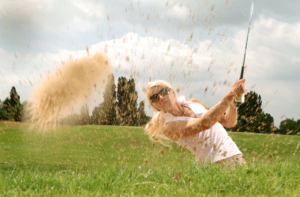 This happens when a golfer exerts strain on one muscle or a muscle group, or resumes playing golf for the first time in a while, or plays a longer round of golf than usual. The soreness develops due to microscopic tears or micro injuries that occur in the muscle tissue as a result of exertion. Further exertion often causes muscle injury beyond the normal microscopic tears. DOMS require medical attention, and will not heal on their own. The rotational stresses of the swing can place a lot of pressure on the spine and muscles, add to it four to five hours swinging a club, standing, bending, and repeating the same motion hundreds of times. Muscles get tighter, get shorter, and are prone to spasms and severe injuries. Tendonitis is the inflammation of the tendon and is the most common condition affecting the elbow. When there is injury to the outer tendon it is referred to as “tennis elbow”, and when there is injury to the inner tendon it’s called “golfer’s elbow”. Oddly, most golfers suffer more from “tennis elbow” than “golfer’s elbow.” The risk of getting tendinitis increases with age, and is higher in people who play golf and routinely perform activities with repetitive movements such as hitting golf balls. These injuries are aggravated and get worse and more frequent with improper swings. Knee and Hip pain is caused by the strain placed on the joints to stabilize the rotation pivoting and twisting of the hip and knee during every swing. Extreme force placed on the Hips and Knees can result in torn ligaments. Arthritis sufferers will experience more hip and knee problems due to the already existing degenerative nature of the disease. Pain and injury can happen at various phases of a golf swing. Injuries to the rotator cuff can be sustained through traumatic force resulting from a poorly executed golf swing, hitting the ground, or simply from overuse. Most common are tendonitis, bursitis, and rotator cuff tears. Good Physical Therapy with state of the art new technology has proven successful in avoiding surgery. LISTENING TO THE BODY, by taking into consideration the pain AS EARLY AS ONSET of the inflammation, is EXTREMELY IMPORTANT to avoid major injuries. High speed and repetitive movement while swinging can cause inflammation, strains and sprains. If not taken care of quickly will lead to serious injuries. Golfers must monitor pain, swelling, tightness and tenderness. From start to finish, there is a lot of strain on the feet and the ankles during the golf swing. Sprains, strains, tendinitis and swelling are very common. Avoiding major injury is possible by listening to the signs the body gives, like swelling, pain, tightness and soreness.